This is the second rainbow skirt I'm making. I finished Leah's a while back and have for far too long been meaning to get one made for Olivia. I began this one shortly after completeing the first one. I have not worked on it much. Mostly because the sack I have it in is large. I carry around this sack full of odds 'n ends yarn so that I am able to choose the next color. 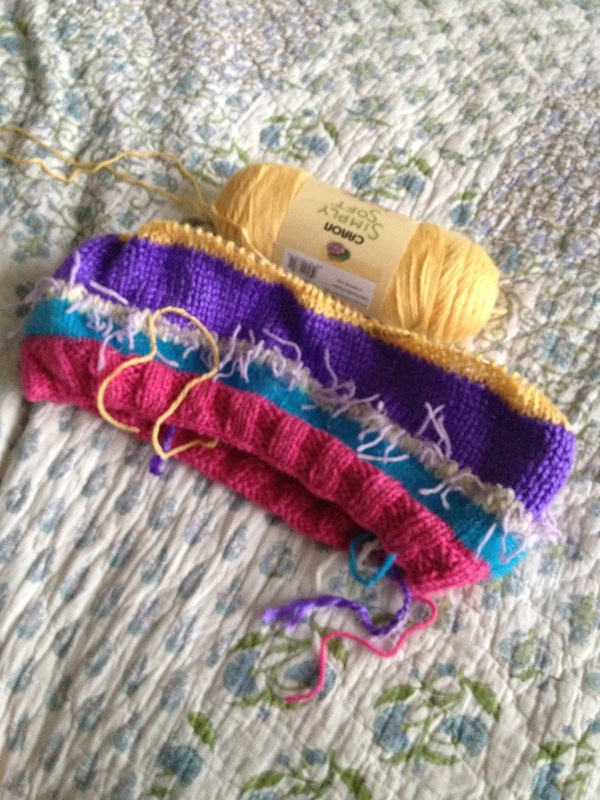 Depending on my mood or how the previous rows turn out my choice for color will not be predictable. Currently that yellow yarn is making me irritated. I plain don't like its texture. The reason why I have put off working on this skirt. 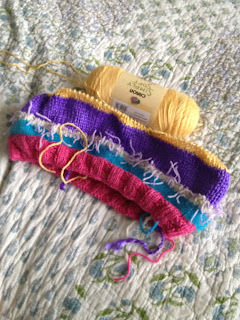 I want to get a another few rounds in to make the yellow a bigger portion but it's not going to be possible. It's time for a different yarn. Something funky with lots of color. I have to keep in mind that this is for my clash girl. She loves all things crazy patterned with BOLD colors. I am battling within myself over the next yarn. The lesson I learned from the first skirt is to just go with it. I can't let too much planning take over because then the skirt loses its fun. This is a skirt that needs to be impulsive. Some how, some way, these varied yarns come together and make a beautiful garment. If anything I do have a deadline. It's Christmas morning. Not long from now so I better get working because these days have been going by so quickly!